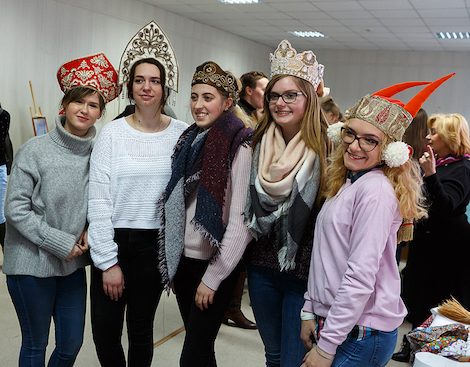 January 22, 2018: fourteen students and three teachers of Lüdenscheid's Adolf Reichwein Gesamtschule are visiting the city of Taganrog within the framework of international educational exchanges with Taganrog Chekhov Teachers' College. The program consists of practical training at Taganrog Municipal Schools no. 5, 6; Chekhov Public Library and Interface translation agency. The long-term study-abroad exchange program began in 2001. Since that time 13 delegations of German school students came to Taganrog and 12 groups of Taganrog college students went to Lüdenscheid. 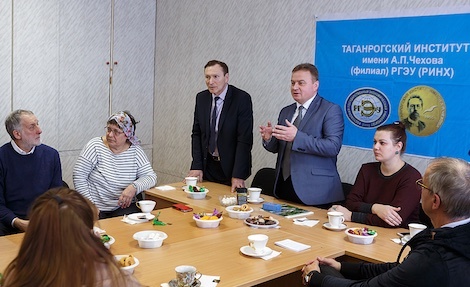 During their stay in Taganrog, German guests met with the local education authorities, specialists of the foreign relations office and on January 16 were received by Mr. Goloborodko, Taganrog Chekhov Teachers' College director. Andrei Goloborodko and Dr. Victor Kulikov discussed with their counterparts from the sister city of Lüdenscheid the new prospective areas of cooperation, including the Russian Summer School in Taganrog for students from Lüdenscheid. Both sides highlighted the importance of this form of "popular diplomacy", which is essential for strengthening international educational, scientific and cultural cooperation. The Taganrog Chekhov Teachers' College students will soon reciprocate this visit, which is expected to give a further boost to Russian-German friendships.